That most valuable of commodities. That sweet ivory nectar. Men would kill for it, men would die for it. For a taste of its small, supple, pillowy bosom. For with rice, as with all things, a darkness shadows a valiant purpose. There was a land, thousands of miles across the galaxy, a land where rice was all. A minute planet far within the Tichbar system, in between Koryoc, Kloryoc and the Seven Moons, Kryoc was made of rice. Or, rather, its bumpy, white, shaft-like hills were. At the core of every hill, of which there were an infinite horizon, lay miles upon miles, tons upon tons of the milky substance. It was a peaceful land where the Kryokees lived without conflict. For the Kryokees, the hills were sacred, none would ever dare betray their purity. Without them, the Kryokees were lost. Kylias* provided the people of Kryoc with all they needed. Rice farmers would travel to Kylias and there, they would carry home a calculated amount of Kjii* which would feed their families for years. But the Hargyans, a race of rice-seekers from a nearby star system, whose planet neither needed nor deserved rice, had infiltrated Kryoc with the intention of extracting all the rice from the sacred hills to use as currency across the universe, for that rice, the rice buried deep inside the Kryokian hills, possessed a crystal-like fragility and a taste purer than the sky itself. It was also extremely rare and, of course, extremely valuable. Even more so than the rice the farmers grew. When the Hargyans came, with their weapons, their advanced machinery and their greed, the Kryokees, not being a warring people, had no choice but to cooperate. The Kylias had been drained almost entirely and the rice farmers became rice miners, working to extract the rice from the very hills they worshipped and protected. Soon, the Kryokees would have no choice but to rely on that very rice but by then the Hargyans would have no doubt gained global control over it and it wouldn’t be long before a famin would hit the Kryokees, a famin from which there would be no escape. A small group of Kryokian rebels, The Kryad, was believed to exist but what could they do? The Hargyans were fierce and their army was far superior (there was no such thing as an army on Kryoc). The Talarians were peacekeepers, scouting the cosmos for conflicts in the hope of resolving them as best as possible. Their mission had been approved by the United Federation Of Space, Planets And Intergalactic Activities (UFSPIA) aeons ago and they were a respected race throughout the galaxy. The Talarian elders had prophecised the Kyokees’ doom and now their ship was approaching Kryoc. In the Titanus*, the elders were seated. A young Talarian soon entered. To say young Hazar, son of Razar and Shazaria, of the 2nd Talarian Kingdom, was a beautiful soldier would have been an understatement: he was radiant. Like a star. His long, flowing blonde hair shone impressively and smelled like the finest Stign* in Glornar*. Kylias: A lake of white, milk-like liquid used by Kryokian farmers to help grow their own rice. Kjii: The white, milk-like liquid found within the Kylias. Titanus: A large meeting hall at the heart of the lead Talarian ship. Stign: Flower creature known for its powerful, unmistakable scent. Stigns, when crushed, are believed to bear aphrodisiac properties (if ingested anally). Glornar: Region of the 8th Talarian Kingdom. It is mostly populated by Stigns. Most Talarians who have entered the region, have never returned. Those who have returned, remember it fondly. More extracts from Ebert E. Bert’s “The Rice Farmers Of Kryoc” will come soon. 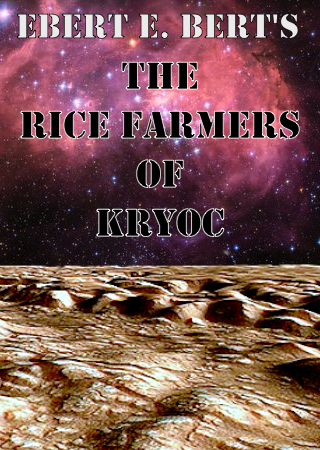 Forgotten writer Ebert E. Bert’s visionary science-fiction novel “The Rice Farmers Of Kryoc” may not have had the exposure it deserved but it’s slowly becoming a cult classic. Expect segments from the never-published epic soon but in the meantime, here’s what the critics have said about it thusfar. Coming soon, only on WeTheMindThinkers.